If you want to work with any type of database, our CardExchange® Producer Small Business Server Business Edition is the best choice to make! With the SBS Professional Edition we offer high speed and secure database connections which enables you to load large amounts of data to your computer in a very short time. Besides supporting direct (native) connections to all large database servers, it also enables you to make database connection using ODBC. The SBS Professional Edition is a supreme product for embedding inside organizations using multiple databases. 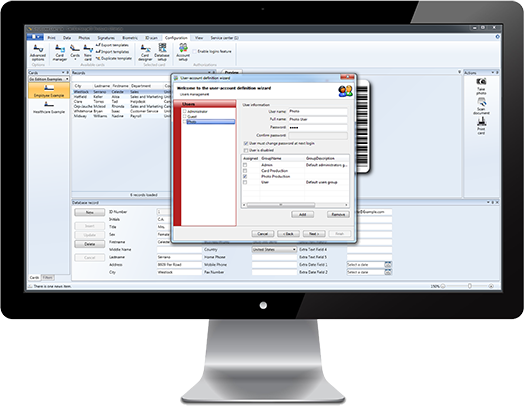 Combining HR, Access Control, Library, and any other type of application using a database, these data sources can easily be updated with data during your production process using our powerful push-and-pull functionality. You can simply connect to unlimited database servers inside your organization. The perfect solution for mid-high level businesses, high schools, and Universities. Our CardExchange® Producer SBS Professional Edition licenses are managed via the central license manager which can run on a local computer or central network server. Licenses can be easily added to the license manager. There are no limitations with regards to the amount of print clients that can be used.